RECON HDDTM (High Definition Data) samples at 40 samples/ft (132 samples/m), which is nearly four (4) times greater than industry’s 9-12 samples/ft (28-40 samples/m) for high resolution logs, and sixteen (16) times more than industry’s 2-3 samples/ft (8-10 samples/m) for main pass logs. RECON STANDARD: Typical logging speed for industry standard main pass resolution logs is 1,800 feet/hour (9 meters/minute). RECON STANDARD pass logs, which are the equivalent of industry High Resolution logs, are run at 1,800 feet/hour (9 meters/minute). In comparison industry high res logs are run at ~800 feet/hour (4 to 5 meters/minute)*. RECON HDDTM: High Definition Data logs are run at ~1,500 feet/hour (~7 1/2 meters/minute). This is nearly twice (2x) as fast as industry high resolution logs with four (4) times more data acquisition*. These advantages mean more data for the same/less amount of rig time, equating to better reservoir understanding and operational cost savings. Benefits of HDD™ range from more accurate reserve calculations, bed boundary definition, better thin bed identification, superior laminated zone identification and more precise porosity values. 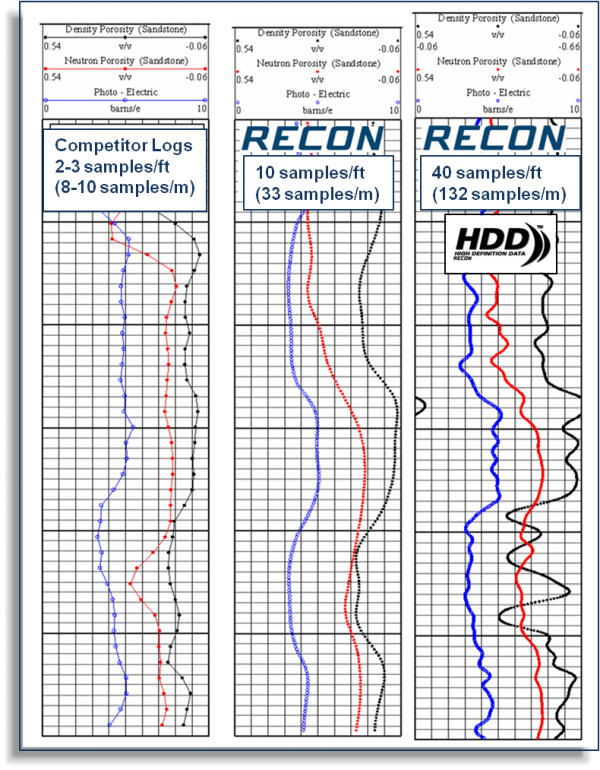 For a more detailed description of the benefits of RECON STANDARD and RECON HDDTM Open Hole Well Logging services click here. RECON offers a variety of tools that may be run individually or in combination to give our clients the desired data set they require for a successful job. To view our Standard Tool String Schematics click here. *The speeds presented are averages and can vary between service companies based on; tools being run, portion of hole being logged (zone of interest, up-hole / non-interest zone), and hole conditions.